The city of Basel in Switzerland has the largest area of green roofs per capita in the world. 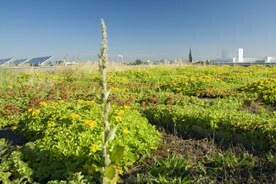 Initiatives aiming to increase the provision of green roofs in Basel were initially driven by energy-saving programmes, and subsequently by biodiversity conservation. 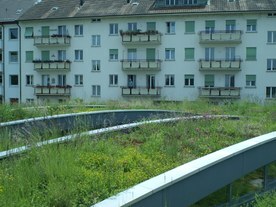 The City of Basel has promoted green roofs via investment in incentive programmes, which provided subsidies for green roof installation (1996-1997 and 2005-2006). The programmes were funded from the Energy Saving Fund made of 5% of all customers’ energy bills in the Basel canton. In 2002, an amendment to the City of Basel’s Building and Construction Law was passed. It reads that all new and renovated flat roofs must be greened and also stipulates associated design guidelines. This is likely to bring adaptation benefits in the form of lower temperatures and reduced surface runoff. Between 1970 and 2007, 1.5ºC temperature increase was observed in Switzerland. In comparison to the beginning of the 20th century, the frequency of intense rainstorms north of the Alps has increased by between 15 to 70% depending on location. Future climate projections suggest that by 2050s the temperature in Switzerland north of the Alps could increase by 2ºC in winter and 2.5ºC in summer. By 2100, under a high greenhouse emissions scenario, the temperature is projected to increase by about 4.5 ºC in comparison to the 1990s. This means that every second summer will be as hot or even hotter than the temperatures reached during the 2003 heat wave which caused severe loss of life across Europe. Extreme precipitation events are likely to increase in frequency and severity. Green roofs were found to offer opportunities to combine energy saving, climate change mitigation and adaptation, and biodiversity objectives. The main aim of the green roof initiative is to increase the coverage of green roofs in the city of Basel through the use of a combination of financial incentives and building regulations. Reducing energy consumption of buildings and protection of biodiversity have been the initial key motivators. Initially, green roofs, as a measure of energy saving, were funded by the City of Basel for a two-year period in the mid-1990s to stimulate interest and awareness. Encouraged by the success of this project, funds were allocated for a study documenting the biodiversity benefits of green roofs. It is now recognised that green roofs also provide a climate change adaptation function through limiting surface water runoff and reducing temperature in urban areas. In many cities of Switzerland, green roofs became popular in the 1970’s as an element of ecological construction. Numerous green roofs were created in the 1980s, mainly as pilot projects, which provided a foundation of knowledge and experience for later initiatives. In addition, 1995 was the EU year of Nature Conservation. This provided the impetus for Basel’s first green roof campaign, which started in 1996. In the early 1990’s the City of Basel implemented a law to support energy saving measures. According to this law, which was the only one of its type in Switzerland, 5% of all customers’ energy bills are put into an Energy Saving Fund, which is then used to fund energy saving campaigns and measures. The national Department of Environment and Energy decided to pursue and promote green roofs using this source of funds. Green roofs on flat roofs over 1,000 square meters must involve consultation with the city’s green roof expert during design and construction. Prior to the first incentive programme (1996-1997), the Department of Environment and Energy conducted a poll with the Swiss public to determine the level of support for an electricity tax to pay for energy-saving measures. The focus on green roofs was promoted by the researchers from the Zurich University of Applied Sciences (ZHAW) in Wädenswil, Switzerland, who worked to influence decision-makers in Basel to amend the building regulations and offer financial incentives to increase green roof coverage. 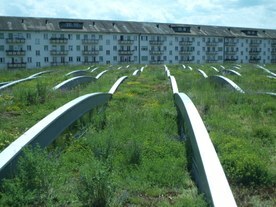 Various stakeholders were consulted when developing the green roof concept, and in establishing the first incentive programme: the local business association, the horticultural association, the green roof association, the Pro Natura Basel environmental organization, the Department of Parks and Cemeteries in the City of Basel, and the National Department of Environment, Forest and Landscapes. Basel’s green roof regulations did not meet with any significant resistance because all stakeholders were involved in the process from the beginning, and due to the success of the incentive programmes. For developers, installing green roofs is now considered to be a routine practice, and developers make no objections to installing them. The incentive programmes were targeted at businesses as well as the residents of Basel. During the incentives programme in 1996-97, the media interest in was high, and newspapers and posters were used to inform residents of Basel about the subsidies. This played an important role in its success through increasing awareness of green roofs across a range of stakeholders. Contests on the best looking green roofs are organised regularly. A comprehensive suite of mechanisms, from incentives to statutory regulations, has ensured a wide uptake of green roofs in Basel. Championship of the project by a committed researcher from the Zurich University of Applied Sciences (Stefan Brenneisen) contributed to the initiative’s success. Involvement of all stakeholders from the beginning of the initiative helped to address questions and concerns and ensured that everyone’s goals were met. An important lesson is that in the urban context climate change adaptation can be compatible with mitigation; the case of Basel illustrates that adaptation can be driven by the actions aiming at energy saving and climate change mitigation. Such opportunities of utilising the existing and on-going urban and infrastructure developments driven by other goals for the purposes of adaptation should be sought and maximised in order to avoid maladaptation. Green roofs are an excellent example for this. The initial costs of roof greening were estimated as CHF 100 per square meter. Beneficiaries of the fund received CHF 20 per square meter of green roof, for both new developments and for retrofitting green roofs to an existing building. In total, 135 residents and businesses applied for a green roof subsidy, which resulted in greening of 85,000 per square meter of roofs. The consequent energy savings for Basel were estimated at 4 GWh/year. 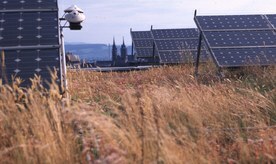 No information is available as to whether the energy savings have achieved a return on the initial investment for the individual properties in Basel; however, according to some literature, green roofs tend to be 10–14% more expensive than traditional roofs over their lifespan due to their initial costs (the cost of maintaining extensive green roofs is similar to that for traditional roofs). Thus, a 20% reduction in green-roof construction cost (such as that achieved through the subsidy scheme) is sufficient to equalise the costs of green and traditional roofs for investors, which suggests that green roofs are not only a sustainable but also a financially feasible option. This even leaves out the fact that green roofs have additional multiple benefits, including absorbing rainwater and delaying runoff (hence reducing flood risk in high intensity rainfall events); providing insulation and helping to lower urban air temperatures and mitigate the urban heat island effect; creating a habitat for plant and wildlife; and providing a more aesthetically pleasing urban landscape. Basel passed a Building and Construction Law requiring green roofs on all new developments with flat roofs. The Building and Construction Law has since provided a major impetus for more green roofs in Basel. An amendment, passed in 2002, reads that all new and renovated flat roofs must be greened and also stipulates their design to maximise the biodiversity. Green roofs are private initiave that can be stimulated by the government. 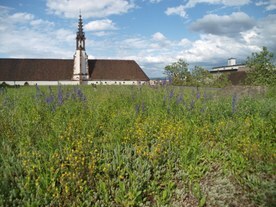 In Basel, two green roof incentive programmes operated for specified two year long periods (1996-1997 and 2005-06). Green roofs have an expected lifetime of about 50 years.